There are many reasons to get outside and enjoy the day. It’s a beautiful day here in Atlanta and the perfect weather to get some sunlight. 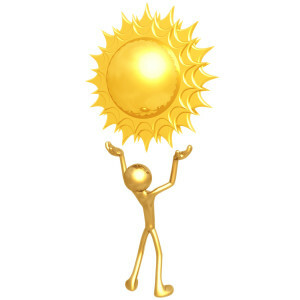 Vitamin D is more important than you may realize and plays a very important role in your overall health and wellness. For starters Vitamin D mostly enters the body from direct exposure in the sun. This means being outside and not just getting indirect sunlight through a window. This is the absolute best way. There are some foods that contain Vitamin d as well. Some people also benefit from a supplement containing vitamin d.
Vitamin d plays a very important role in the prevention of osteoporosis and bone disorders. Calcium and vitamin d work together to strengthen bone tissue and prevent fractures. Supplementing vitamin d must be monitored closely to avoid increasing levels too high. If the amount of vitamin d is not properly absorbed into the bone tissue and increases the amount in the blood problems can arise. Kidney damage and other symptoms of toxicity can develop. Combining vitamin d supplements with certain types of medications or other supplements can also be harmful. Other benefits besides bone strength include cell growth, helping the immune system function and reduced inflammation. Very few foods contain vitamin d but there are many that become fortified to include it like dairy products and cereals. A vitamin d deficiency can take months to reverse and the population group with the highest deficiency rate are seniors living in nursing homes. There should be no reason for a vitamin d deficiency but you will not hear much media attention given to this problem because there’s no drug to sell. Increasing levels is as easy as spending as little as fifteen minutes in the sun each day. Don’t hesitate to contact me if you have any questions about a nagging health complaint. I will let you know the right direction to get yourself to how you want to feel.